How do I fight my most defiant and deadly adversary when it is my own damned soul? A soul that will never stop taking and punishing. "Anyone tried to kill you?" [Onyx] asked. I rolled my eyes. "Not yet," I replied. "Not yet," I said again, fighting the urge to smile. And I realized that it couldn't be about risking it all. That was the whole point. It was about fighting to keep it. Simply put, this series ending novel is all I could have hoped for and more. We catch up with Violet after she has been living in London for a year. After constantly moving with her parents, Violet decides to go off on her own and stumbles upon a group of Rogues who quickly take her in. With the exception of Gray, whom we met in Emblaze while they were in Santorini, the Rogues are unaware of who Violet really is - "the chick everyone's been whispering about the past two years." Violet is merely living day to day, and thanks to Phoenix's essence, is able to keep the pain of not being with Lincoln at bay. Essentially, she is emotionless. It's not until she learns that Spence has been taken (by the mysterious bald guy that took her blood at the end of Endless) that Violet realizes that you can't truly run away from your problems. It's been less than a year since I read Endless, but I truly missed each and every one of these characters. And I'm going to miss them. I was equally as excited as Violet when she reunites with Steph, Dapper, Zoe, Onyx, etc. and equally nervous when she and Lincoln have their first contact. The tension between Violet and Lincoln is also wonderfully done. Jessica doesn't give it all to us at once, but dangles their relationship in front of us - just out of reach. I'll admit that I wasn't a fan of Lincoln in the beginning of the series, but I am firmly a believer in the love between these two characters. Jessica doesn't just make you feel for her characters, she completely inserts you into the story. You feel as if you are a member of these tight friendships and privy to the deepest secrets. You root for Lincoln and Violet, feel for Phoenix, want to punch the Assembly when they're acting like an asshat. Okay, that's not fair . . . the only real asshat is Drenson. One of my favorite additions to the group was Gray. Gray is there for Violet and knows about her past and he does what he can to help her. He taught her how to hold up her shields and is an amazing friend to Violet, both while she was on her own and after she returns. While I missed Spence throughout the novel, Gray was a great substitute. I hate to use the word substitute because he is so much more than that. The best way I can describe him is a perfect combination of Spence and Griffin. From the moment Violet comes back to New York, things are on the move. There is not a dull moment at any point in the series and, like me, you cannot put this book down. Not only is it the last of an amazing series, but each chapter ending leaves you hungering for more. Even if it's not a cliffhanger: can't stop won't stop. An engaging plot, wonderful characters, a griping romance Empower is above and beyond an amazing novel from an amazing series. If you haven't started The Violet Eden Chapters or have yet to catch up, you absolutely need to - it's the perfect series to binge read. I can wholeheartedly without a doubt recommend this series to each and every reader. I am also insanely jealous of those of you who get to read it for the first time, but you can bet your bottom dollar I will reread this series again and again. 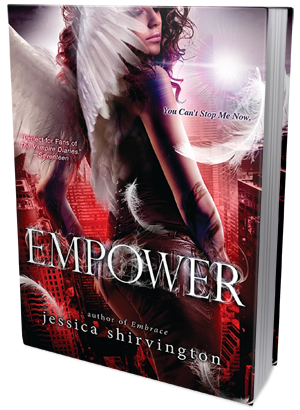 Sourcebooks Fire is offering any and all fans of the series the chance to receive a FREE autographed bookplate for their copy of Empower through EmbracetheSeries.com. The offer ends Monday, May 5th, so be sure to be sure to sign up!